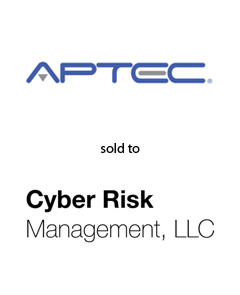 AGC Partners is pleased to announce that its client, APTEC, LLC, a leading provider of security consulting services, has been acquired by Cyber Risk Management, LLC, a leading data risk management services company and a joint investment of Halyard Capital and Norwest Equity Partners. This acquisition will allow Cyber Risk Management to expand its current security services offerings into Identity Access Management (IAM) and Identity as a Service (IDaaS) segments. With a team led by Maria Lewis Kussmaul and Eric Davis, and including Alex Otero and Hanna Yu, AGC Partners acted as sole financial advisor to APTEC.